Just over a month since bud burst (see post of 14 April) and thanks to the fine warm weather the vines are growing strongly. We are busy in the vineyard trying to keep up with them! All being well the vines will flower in about three weeks time (early/mid June) and at that point the tiny grapes will form. 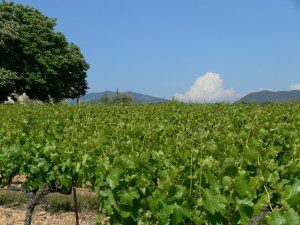 The picture shows one of our Grenache Côtes du Rhône vineyards looking East towards the Pré-Alpes, you can just see some clouds bubbling up over the mountains.